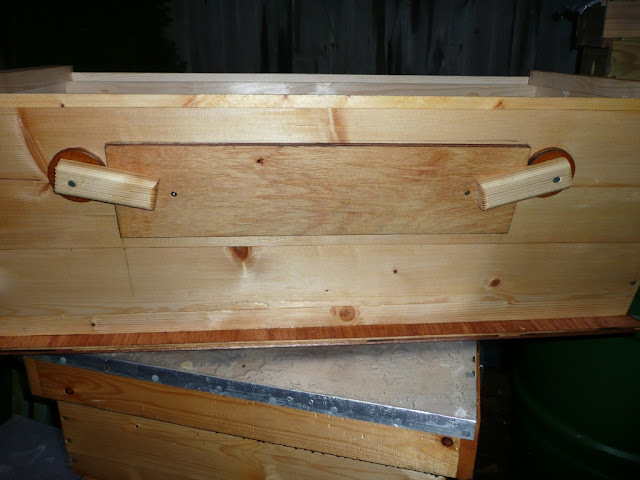 So, I'm a new beekeeper (no bees yet), building my first top bar hive, probably this weekend. I have looked at some free plans online, including the pdf available at biobees.com, as well as some youtube videos, and it seems pretty easy to build, thank goodness. But...one thing I have not been able to find, is how to install an observation window. I would really like one of these, but maybe it is not for beginners? Can any of you direct me to a site/book that will give me instructions on how to make an observation window? I think it would be so awesome to have one on my TBH! Welcome to the forum and to beekeeping. This is a great time to look into the "search" function of this site. Look just under the masthead on the beekeeping forum page, hit the search button, type in "observation window" and you will get 611 hits from members who contribute their experiences and designs for observation windows. Of course you'll get a good bit of dross, but there is so much information here from everyone that the real treasure of the site becomes clear with a little work and looking through things. If you play a little with the search site you can get the initial information down some, but read through a little and you will be rewarded. Putting in a window is not difficult. Build the hive, cut out a modest space fro a window (save the cut out piece for a hinged cover after the window is installed), cut some smaller strips to serve as mounts for double glass (plexiglass/perspex is best, I think), the width of the hive wall minus two sheets of glazing materials, and screw everything together. The glass will be flush on both sides. I think that non-glare plexi would be best, since reflected sunlight sometimes interferes. You can get it at a framing shop, I think. Also check out "At The Entrance to the Hive" a book by Storch (I think that's close, if not exact) which gives good advice on "seeing" into the interior of a hive by watching the entrance. Both this and the window help keep the nest secure. The blog in my signature shows photos of mine under construction that might help you. Perspex/plexiglass is less cold to the touch than glass, so should help to keep the bees warm. Bilbehr, I did try a search for "observation window," but all four pages of results just mention it in passing, none include instructions or pictures. Maybe I am entering the wrong search term, but since that search did not produce the results I wanted I decided to post a new topic. Thanks for the basic instructions, the only thing I am not sure how to do is cut the plexiglass - for a previous project I tried cutting with a scroll saw but the plexiglass melted where I was cutting! Trekmate, I looked at the pictures on your blog and your window construction seems pretty easy, but it looks to me that you just attached the perspex to the inside of the hive. Pardon my inexperience, but I thought that this would cause propolis problems because now the hive wall is not smooth, but instead has a lip where the perspex meets the wood? 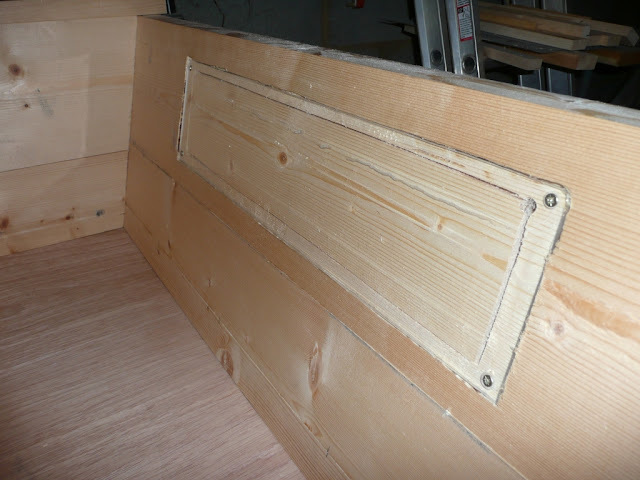 The perspex is rebated into the hive wall to leave a smooth finish, flush with the hive wall, checked by sliding the follower board along the hive. No bees in that hive yet, but I expect to see a little wax/propylis on the perspex when there is. Should be interesting trying to clean it off without scratching!! Can you explain "rebated" to me? Also, how is perspex different from plexiglass, and did you have to cut it to fit (and what did you cut it with?) Thanks for all the answers! When I built my tbh I used 4 by 1 inch timber for the sides. This was using the plans for a tbh free from this site. Joining three of these together with a piece of wood across them in four places was straight forward (and helps stop the sides from warping). It was a simple matter to leave a long section out of the middle one on the side opposite the entrance holes.... the tbh on this site has holes on the sides rather than the end. You then need a piece of perspex/plexiglass 4 inches wide and as long as you left out. I cannot remember which of my saws I used but I think it was an ordinary 'cross cut' saw..... I do not know what your name is for them but a general wood or carpentry saw... I do not think it was my smaller toothed tenon saw. Have a go but be careful as perspex is brittle. To install the window I offered the perspex up to the hole and making sure it was flush with the inside, marked its position and pinned (with panel pins... small very thin nails) a thin square section wood all around the inside of the gap where the window would be so the window sits against it. I glued the window onto this wood that formed a rebate. Remember to have the window flush with the inside. I cut some exterior ply wood for a cover; it will need a cover. I hope that was clear, sometimes words and names of things are different. I think perspex is what we say in the UK and plexiglass is maybe the word used elsewhere. By perspex I mean a hard, clear, solid, plastic used as windows in sheds etc. or places where glass cannot be used. It is warmer than glass and does not have the same condensation problems. Rebate - Woodworking term for a groove (also known as a rabbet). This groove is cut to the edge of the hole for the window, depth the same as the thickness of the perspex. The perspex then sits in the rebate and is level with the wood on the inside of the hive. Perspex is in the UK, plexiglass in USA. I think that's the only difference! Two nations divided by a common language. I used a powered jig-saw with a VERY fine toothed blade (many teeth per inch). Any fine toothed saw will work. If using a power tool, clamp the perspex to a bench along it's length to prevent it jumping with the blade movement. The rebate is simple enough provided you have the tools. I marked out the window size I wanted and then drilled two holes in oppersite corners so I could use a jigsaw to cut out the window. Then finished off by using the router to trim off the wood surrounding the hole to the same depth of the perspex. When I drilled the holes in the perspex I made them slightly oversized and countersunk them so the screws would hold the perspex in place but still allowed the perspex to move a small amount in case the hive warped slightly. Hope the pictures help to explain it slightly better than I have. A sharp knife along a firmly held strait edge, scoring the plexi ten or so times (this is for 1/8" plexi--thicker might not work as well), then carefully bending at the score held over another straight edge like a bench or table top, works very well. It should snap along the score. I looked through many of the entries on the returns from the search, and there are many photos, and while there are no step-by-step instructions, much information can be gleaned from this. I really have never come across a step-by-step set of directions for this. It takes a little time and work to dig out the gold from this information mine. Also, if you select "search message text only" it narrows the search to a limited number, and then just look at the titles that have "observation window", you will be more likely to get entries that give good instructions for this. A rebate is a recess cut into the wood that allows the plexi to set flush with the surface. It requires tooling machines such as a router or table saw to make it. If you make a frame, as I suggested, screwed and glued to the opening you cut into the hive, and cut at the width of the hive minus the width of the glazing you are using (for example, if your hive is 3/4" thick, the plexi is 1/8", and you are double glazing, two sheets of glazing, make the frame 1/2" thick and space it so one layer of glazing goes on the inside, one on the outside. It is easier, does not require so many tools. Ah, I am beginning to understand! I'm a visual learner, I guess; the pictures helped a lot to comprehend everyone's explanations. I just have a scroll saw and a circular saw to work with, so it will be a bit of a challenge, but if I work slowly hopefully I can produce a good viewing window. Thanks so much, guys! Another question, and please forgive my ignorance as I have not yet kept bees. I am wondering what the problem would be of having a plexiglas/perspex window on an entire side of the TBH, with a wood frame behind it, anchoring it to the rest of the hive, and hinged door covering that entire side. I mean, they sell observation hives with lots of glass, so the bees must not be too bothered by it, right? I don't have any concerns about heat loss here in Tucson, it only gets below freezing in the middle of the night for 3-5 days the entire year. Is there any other reason why I wouldn't want to make a window covering one entire side of the hive? I hope to make this hive tomorrow, so hopefully I can get my plans finalized tonight with your help. Thanks again! I haven't thought of this, or tried anything like it, but it seems like there would be two problems, at least. First, plexi is neither as strong as wood nor as good an insulator. It is difficult to fasten well, and two dissimilar materials expand and contract differently, and so they need to be treated differently. Even if a temperate climate like Tucson seems to need little regulation, insulation serves to help with heating and cooling equally, and plexi is not as good for this, I would think. Wood also tempers moisture condensation better, it seems. Bees will locate in many materials, wood being most readily available, so plastic is not precluded, but probably not the most bee-friendly. Second, there is a limit to the information that can be gathered from watching through a window. That's why other methods are recommended, such as entrance observations, hive weights, debris inspections and the like. One of the benefits of a window is not so much watching but keeping the beek out of the nest. But observation hives are notorious for causing anxiety on the part of bees, and it is difficult to keep colonies for very long in such hives. So don't assume that a clear wall and an opaque one, wood for instance, are equal in value. On balance a small window that allows looking in the side, and maybe a clear follower board or a window in the follower board, seem to be best recommendations. I do have a clear follower, but it gives limited information. Putting in a window is not difficult. Build the hive, cut out a modest space fro a window (save the cut out piece for a hinged cover after the window is installed), cut some smaller strips to serve as mounts for double glass (plexiglass/perspex is best, I think), the width of the hive wall minus two sheets of glazing materials, and screw everything together. The glass will be flush on both sides. Aaah -- I've been asking the same question and also found searching to be less successful until I search using "easy observation window". I knew there had to be a way to do this without needing a router, and I was pretty sure a frame had something to do with it, but my non-engineering brain couldn't quite put the pieces together. Now, I get it! Thank you . I use 4 inch x 1 inch timber, 3ft or 4ft long (depending what length hive you want) join three together with batons to make it 12 inches wide but leave a section out of the middle one for a window. Works OK as the batons stop the planks from 'dishing' so much which is important if you are using follower boards. Only a saw is needed. I am a new beekeeper. Built a TBH from plans I purchased. The wall with the viewing window I built from 1 x 4 the same way you would build a pic. frame or the stiles and rails for a door. I used a router to rabbit the inside of the viewing area. I used a 1/8 inch tempered glass that the local shop cut to my size and "glued" it into place with a latex ext. caulk. Flush to the inside. 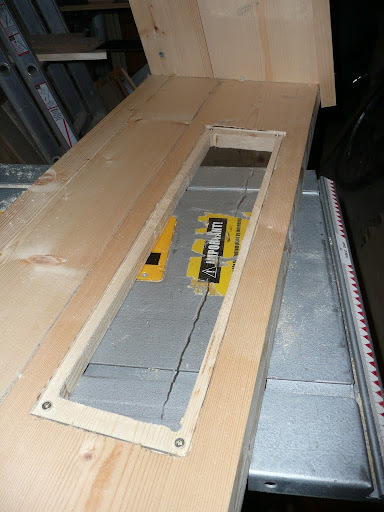 I made a removable door for the outside and it is kept closed except for when I want to ck. on my bees. Glass will not scratch or fog like plastic and as it will be colder in the winter it provides a place for excess humidity to condensate on. Gives the bees a source of water in the winter. I remove the door in the winter when I wrap the the hive in rigid foam insulation. You can get a good affordable router on ebay. I just purchased an ex. 1/4" collet router for less than $30.00 incl. shipping. With the router you can also spline your boards for glue up. I am wondering what the problem would be of having a plexiglas/perspex window on an entire side of the TBH, with a wood frame behind it, anchoring it to the rest of the hive, and hinged door covering that entire side. I mean, they sell observation hives with lots of glass, so the bees must not be too bothered by it, right? I was exactly thinking about this, possibly with two double or triple sheeted glass, even filled with argon, etc. I think the major problem is that whatever glass you take, it would insulate fine (better than wood) perpendicular to the surface (from the outside to inside). But you would be left with one sheet of glass going all the way from the bottom to the top. That layer of glass on the inside is pretty conductive, and at its bottom it is nearly in contact with the outside air. The insulation would be bad from bottom to top and the surface would be cold. In the hive, you have a gradient ranging from outside-temperature at the bottom, to 35C at the top, and glass would not cooperate well with that gradient. This is an old thread but if I can add my simple construction method to it...maybe it helps someone. I wanted a small rectangular window in the side of my first hive. Double glazed flush to the interior and exterior. Window 350mm x 110 centered on the side and toward the top. Total side is 1100 x 300mm. Side boards are 20mm thick. I had 2 pieces of glass cut at 350mm x 110mm x 4mm thick each. Thats 8mm of glass leaving a centre gap of 12mm in the 20mm sides...which my research showed me was the ideal thermal gap between glass. I ripped 12mm x 12mm fillets of timber then tacked and glued them into the window that I had cut out with a fret saw precisely to the glass. I traced the glass with a fine pencil for this. A bead of clear silicone around the fillets each side set the glass in perfectly. Quick, tidy, flush and easy.